All 16 pieces of Catnip Sushi for 10% off! You can't beat that price! They're all here: Crabbies, Squiddies, Shrimpies, Tuna Rolls, Salmon Wraps, and MORE! Less expensive than real Sushi. Less time consuming than ordering all 16 pieces separately. Cats LOVE fish so why not give them some sushi?! Your cat will go crazy for these cute toys! Shrimp, sardines, calamari oh my! What more could a feline want? If they still have an appetite for some fun you could throw in an egg wrap, tuna roll or some edamame. Whatever you give them we are sure of one thing . . . they will love every bit of it! 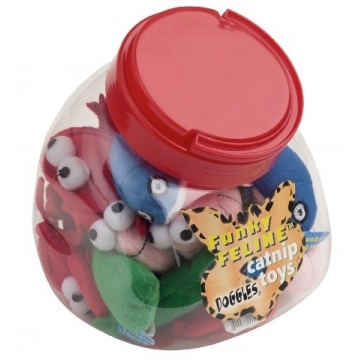 Toys have polyfill with a catnip packet inside, and are approximately 3-inches long. Or you can order Catnip Sushi pieces separately. See "You May Also Like"� on the upper right of your screen.